Reading have completed the signing of former Manchester City goalkeeper Stuart Taylor on a one-year deal. Taylor, 31, has been training with the Royals since he was released by City at the end of last season. He will provide cover for Adam Federici and the move allows manager Brian McDermott to send Mikkel Andersen to Portsmouth on loan for a month. 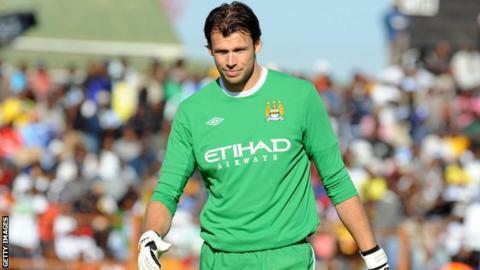 Taylor joined City in 2009 but left Etihad Stadium without making an appearance for the first team. Reading's director of football Nick Hammond told the club's official website: "Stuart is a very experienced goalkeeper at the top level and having him here allows us to loan Mikkel Andersen out and get him some games." Taylor started his career at Arsenal and joined Aston Villa in 2005 before moving to City four years later.